Fighting Blight in Mr. Rogers' NeighborhoodThe Community Foundation of Westmoreland County’s Revitalizing Westmoreland initiative has helped spur community development through moderate-scale, innovative projects. The Oliver Barnes Parklet in downtown Latrobe, Pennsylvania. 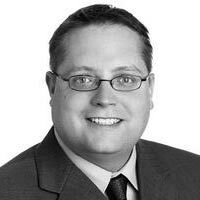 Christopher Whitlatch is a former marketing and communications manager at the Foundation. THE TERM “MAIN STREET” INCREASINGLY EVOKES A BYGONE ERA, a time when downtown streetscapes bustled with the activity of thriving towns and busy shops. Too often, that era has been replaced by big-box suburban stores and an infrastructure in decay. In 2014, the city of Latrobe, Pennsylvania, recognized these issues and chose to meet them head-on with a plan that illustrated a vision for the future of its Main Street business district. Now, two years later, that vision is coming to fruition with the new Oliver Barnes Parklet at the corner of Main and Ligonier Streets. Named for Latrobe’s founder, the parklet is the result of a Revitalizing Westmoreland grant from The Community Foundation of Westmoreland County (CFWC). It sparkles with new seating areas and fresh landscaping, forming an inviting place for the residents of Fred Rogers’ hometown. Today, it’s difficult to remember the dilapidated building and the notorious nuisance bar that once darkened the property. The Revitalizing Westmoreland program encourages new ways to improve the life prospects of Arnold, Jeanette, Greensburg, Latrobe, Lower Burrell, Monessen and New Kensington residents. These communities were selected because they have experienced significant losses in manufacturing and subsequent out-migration. In 2014, the first year for the initiative, the CFWC awarded $150,000 in grants to seed nine community projects. The Latrobe Community Revitalization Program received $25,000, which it supplemented with matching funds and in-kind donations as part of the project to demolish the crumbling bar and replace the building with a public green space. In a perfect system of community revitalization, successful, publicly funded projects propel subsequent private investment. Trunzo points to an early success story in Francesca’s Cakery & Italian Deli, which opened in the building adjacent to the parklet. Though the building has been in Francesca Pampena’s family for three generations, the parklet inspired her to renovate the space for a public business. “I knew I wanted to locate it here, and with a lot of work cleaning up our space and the space next to ours, I was able to open,” says Pampena. She adds that many of her customers take their coffee or lunch outside to the parklet on sunny days. And that partnership doesn’t end with the parklet project. The city received a second Revitalizing Westmoreland grant award of $18,000 in 2015, which will help fund way-finder signs featuring the Mr. Rogers’ Neighborhood Trolley, street planters that are currently being installed throughout the downtown district, and other projects that will continue Latrobe’s beautification and revitalization efforts.